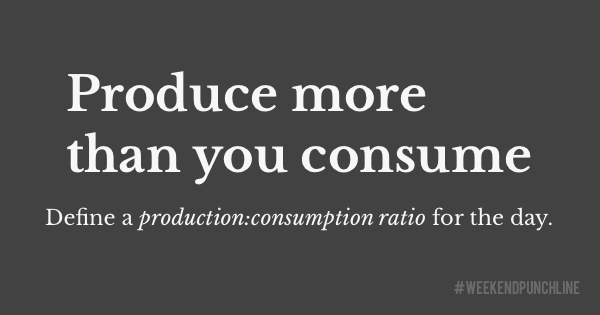 Define a produce:consume ratio that aligns with your lifestyle and preferences. For example: For every 1 hour you work you consume 10 minutes. That’s a 6:1 pro:con ratio. On a normal work day that could give you 50-70 minutes of consumption every day. This is an example ratio. Feel free to adapt it to your needs but make sure you keep the production higher than your consumption. The benefit is: You know when to stop because you defined the amount or ratio yourself. Now you only need to stick to what you said. Will you? Also, having a ratio like that you avoid potential binge-watching which in German is also called „coma watching“. Do you like being in coma because of over-consumption? I’m not sure about your answer but being alive feels better than being in coma. A fully-fledge coma is the most severe form of a quantitative consciousness disorder. I don’t want to ruin your consumption time but know when to stop your consumption for the day so you don’t end in losing your consciousness. Be so kind to yourself. This was episode 4 of the #weekendpunchline . Every Saturday and Sunday.